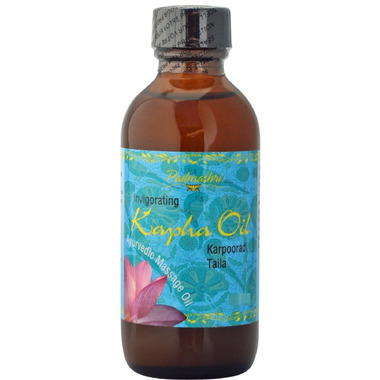 A smaller version of the Padmashri Classic Ayurvedic Massage Oil Kapha, perfect for travel or just to try something new! Padmashri Kapha Oil (Karpuradi Taila) is prepared with Kapha-reducing herbs in a base of cold pressed sesame oil which gives this oil a delightfully aromatic and invigorating scent. Kapha pertains to structure and lubrication in the mind and body. Kapha represents element of Water and Earth. How to Use: Apply warm oil topically to body or affected region. Key Herbs: Traditional formulation with Bishop’s Weed, Arjuna, Cardamom and Camphor and cold pressed sesame oil. For external application only. May contain trace amount of dairy.